How the White House used "#BringBackOurGirls"
Given the technological prowess displayed by President Obama's campaign, it's little surprise that he and first lady Michelle Obama became part of the campaign to find and return the nearly 300 Nigerian schoolgirls kidnapped by Boko Haram last month. Is the U.S. doing enough to help Nigeria find the kidnapped schoolgirls? The first couple's actions were both a part of and a response to the worldwide use of the social media hashtag "#BringBackOurGirls" in a rare example of the public urging foreign intervention during the president's campaign. The kidnappings occurred on April 15, but the hashtag was first used on April 23 when two Nigerians tweeted using the hashtag, "#BringBackOurDaughters," which quickly morphed into its current use. Its usage spiked from a few thousand tweets to roughly 250,000 on April 30, when the kidnappers threatened to sell the girls before quieting down again. The real rise began on May 3, with more than 100,000 instances of the hashtag used on Twitter. By the time President Obama first discussed the kidnapping publicly, on May 6, it was back up to about 225,000. Celebrities and other high-level politicians from former Secretary of State Hillary Clinton to actress Angelina Jolie were starting to speak out. Michelle Obama sent out the message with the now-famous photo of herself holding a sign that read, "#BringBackOurGirls" on May 7. The first lady is involved in public advocacy on just a few issues and rarely discusses foreign policy. Two days later, use of the hashtag spiked at more than 488,000 occurrences on Twitter. The involvement by the first couple "let others know that they care," said Scott Talan, a professor of public communication at American University. Talan said the story gained national prominence in large part because of its social media presence. Mr. Obama first spoke about the kidnappings while giving interviews with reporters about climate change. But the social media presence has also kept the story in the news, giving prime media retail to details of the U.S. involvement in the operation, which began last week. "People are still saying we've not forgotten and you still see stories about this and you still see pledges of action from countries," Talan said. 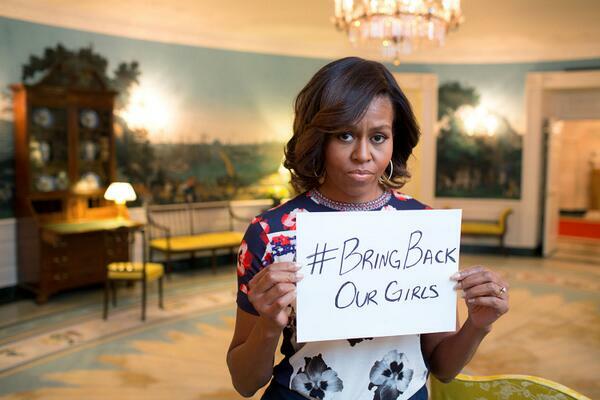 Even as use of "#BringBackOurGirls" began to dip, Michelle Obama stayed involved. May 10, when the hashtag was only used about 200,000 times, she gave her first-ever solo White House weekly address saying she was "outraged and heartbroken" by the attacks. There are, of course, limits to any social media advocacy campaign. A similar effort to push the U.S. to hunt for warlord Joseph Kony did push the issue to the forefront and the U.S. sent special forces to Africa to aid with the search. But Kony is still at large. But it has given a voice to a cause that might have otherwise gotten little attention. Social media, "can't solve everything immediately but the converse is very little knowledge, very little awareness and much greater chances for nothing being done," said Talan. While there has been praise for the campaign - "All this may or may not help, but it's worth trying," Nicholas Kristof wrote in the New York Times - others have warned that the Obamas involvement makes his administration look juvenile. "Often, members of the Obama administration speak and, worse, think and act, like a bunch of teenagers," wrote Eliot Cohen, a former counselor at the State Department. "If the United States today looks weak, hesitant and in retreat, it is in part because its leaders and their staff do not carry themselves like adults. They may be charming, bright and attractive; they may have the best of intentions; but they do not look serious. They act as though Twitter and clenched teeth or a pout could stop invasions or rescue kidnapped children in Nigeria." There are also risks: Michelle Obama's photo was quickly co-opted by people critical of the administration's drone policy who edited out the "#BringBackOurGirls" hash tag and wrote messages like, "Nothing will bring back the children murdered by my husband's strikes." Now that the president and first lady are part of the debate, the world may watch more closely to determine whether they follow through. According to the administration, there are now close to 30 specialized American personnel advising Nigeria's government, with 17 from the Department of Defense providing guidance on satellite reconnaissance, four from the FBI with expertise in negotiations and safe recovery of kidnapping victims and five officials from the State Department. But U.S. government officials have expressed frustration with the Nigerian government's response, and Defense Secretary Chuck Hagel told CBS News State Department Correspondent Margaret Brennan Thursday that little can be done until the girls are located. But unlike other foreign policy issues that have faded into the background, this issue may have legs, and the nation's first couple may find themselves talking about this issue for a while. "What is she doing offline?" Talan asked of the first lady. "She has the president's ear on a regular basis. What is she doing besides what's on social media?"